Capo’s Pizza is owned by Tony and Pam Capo. 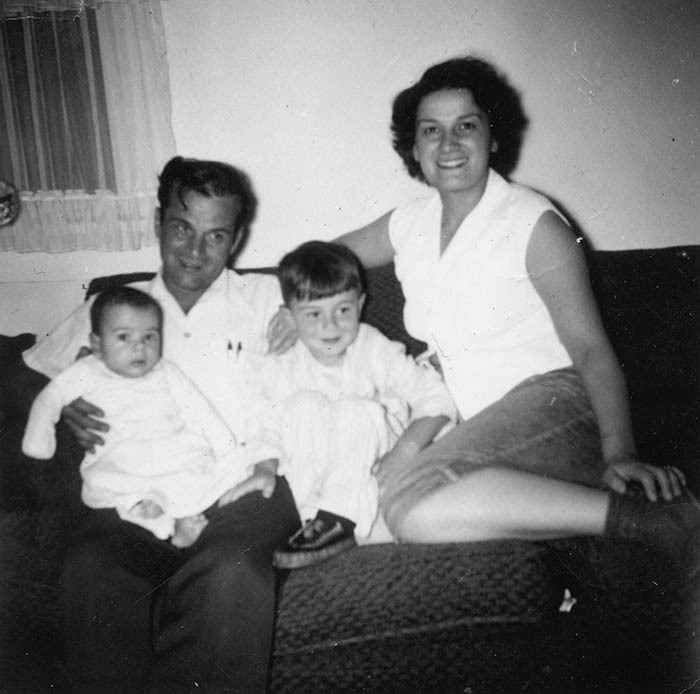 This family photograph was made when Tony was just a boy back in New Brighton, Pa. The family had gathered at Capo’s Pizzeria in New Brighton. 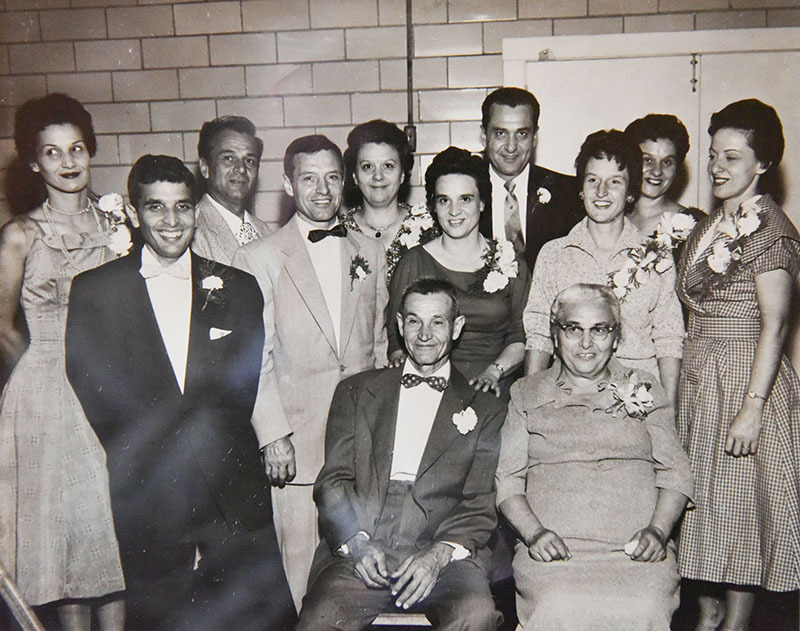 From left are: Tony’s grandparents Mary DiCosimo, Jenny Cap, Dominic Capo, August DiCosimo, cousin Chuck Capo, Tony Capo, Chuck Capo (a cousin) Frank Capo (far back), Danny Capo (in front) and Mary Ann Capo, Tony’s mother. The year was 1963, two years before Frank and Mary Ann set up shop at Geneva-on-the-Lake. Capo’s Pizza opened shop at Geneva-on-the-Lake on July 4, 1965 – the day of the “riots.” Frank Sr. and Mary Ann Capo got the idea of opening their shop at The Lake after taking a wrong turn during a motor trip Memorial Day 1965. The Capos already owned a shop in New Brighton, Pa. 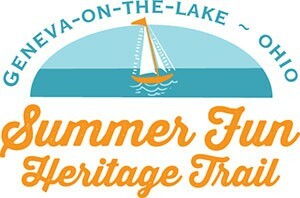 They were heading for Conneaut Lake Park, Pa., on that Memorial Day when they got lost and ended up at Geneva-on-the-Lake. Impressed by the crowds and atmosphere, Frank began researching options for a pizza stand. Their first shop was on a rented lot roughly across from their present location. They sold their pizza slices for 45 cents each, and everything was going great for them until word of the riot reached their stand. Soon, police were telling them and all other vendors on the street to close up and go home. 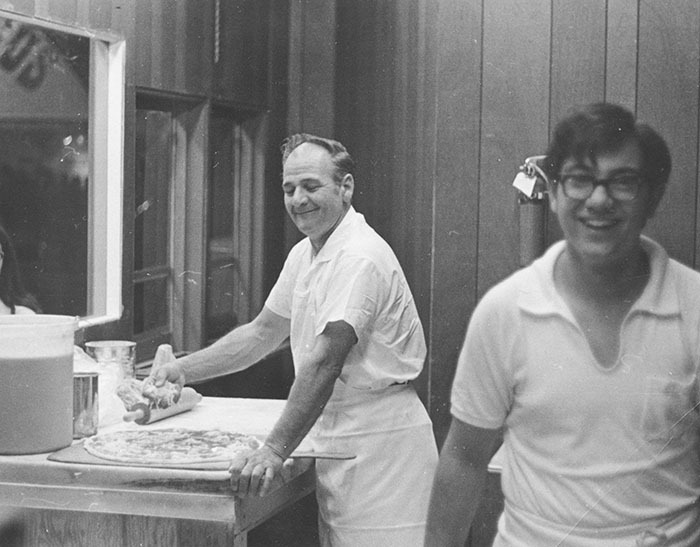 Frank Capo (left) and his son Tony, now the owner, at work in their Geneva-on-the-Lake pizza shop. Despite the rocky start to their business, the Capo family continued to work The Strip that summer and kept returning year after year. They operated out of The Barn for several years, and after that location changed owners, in 1970 they signed on with Martha Woodward at the present location, corner of New Street and The Strip. 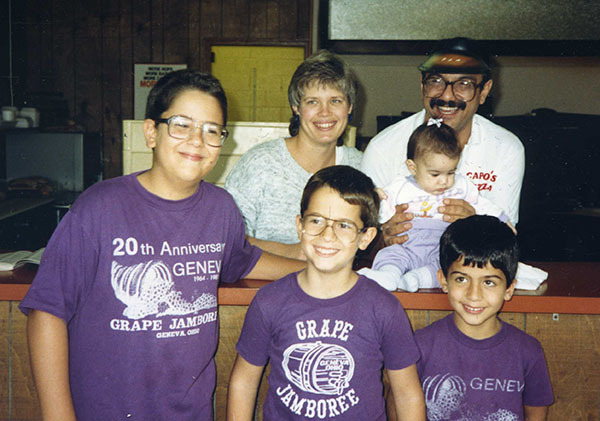 Pizza making has been in the Capo family’s heritage for years. Prior to opening Capo’s Pizzeria on Route 18 in New Brighton, the hometown of Tony’s family, they owned the Pizza Oven in Hornell, N.Y., Mary Ann’s hometown. The family owned that business from 1959 to 1961. Frank and Mary Ann Capo, circa 1954, when they were living in California. At left is Tony; Frank is at right. Frank has the Capo’s II shop in Ashtabula Harbor. Frank and Mary Ann lived in Hollywood, California, in the early 1950s. Frank ran a pizza shop there, and the shop was located across the street from a studio where television shows were produced. GOTL regulars who stopped by to visit with Frank would be entertained by his stories from those days in California. Alex Zimmerman says Frank told him that he appeared in a “I Love Lucy” television episode, the one where Lucy learns to toss the pizza dough in the air. Frank served as technical adviser on the set and is briefly seen in the episode. Tony and his wife, Pam, own both the GOTL and West Main St., Geneva, shops. Their son, Tony Jr., assists them. 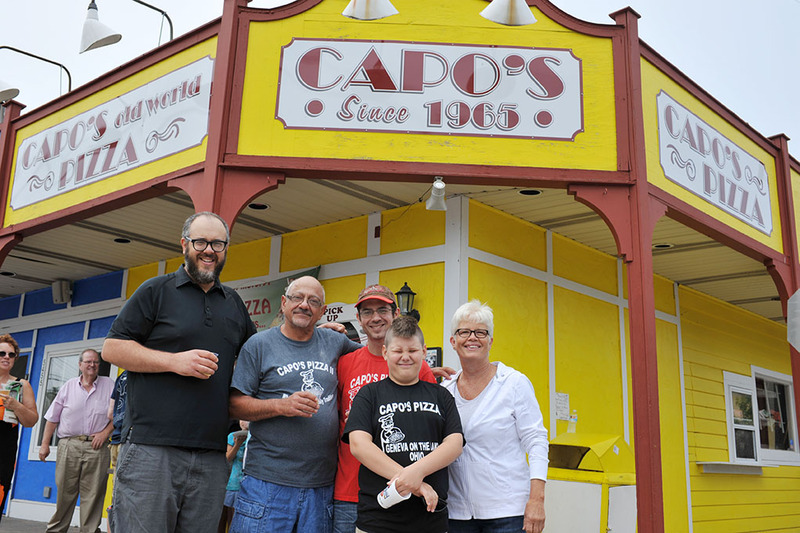 The Capo family pauses from making pizza to celebrate 50 years on The Strip. The celebration was held June 13, 2015. What makes Capo’s pizza so delicious? Tony says simplicity and consistency are two reasons. Their recipe doesn’t change; it’s the one Tony’s father used decades ago. And they keep it to just a few basic ingredients. They also bake their pizzas in a hearth oven, on stones rather than in pans. He estimates that only 10 percent of the area’s pizza shops go to that bother. Capo’s Villa was operated by the family during the summer months from the late 1960s to early 1970s. Tony said the riots brought on a decline in business at The Strip and was a factor in the Capo family closing the restaurant. Pam and Tony Capo pause for a photo with their young family in 1987. From left are Tony Jr., Joe and Chris; daughter Alyssa is on the counter. The Capos live in Geneva. 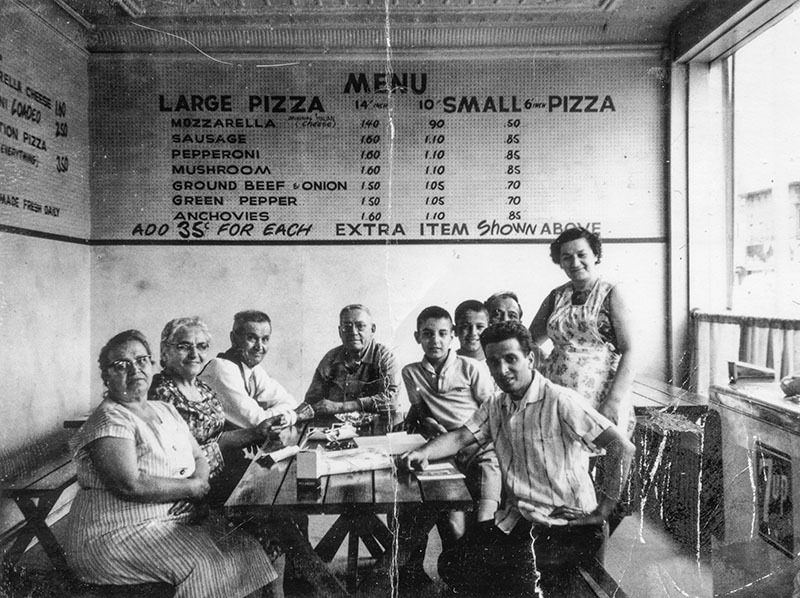 A family portrait of Frank Capo’s parents and siblings hangs in the pizza shop in Geneva. 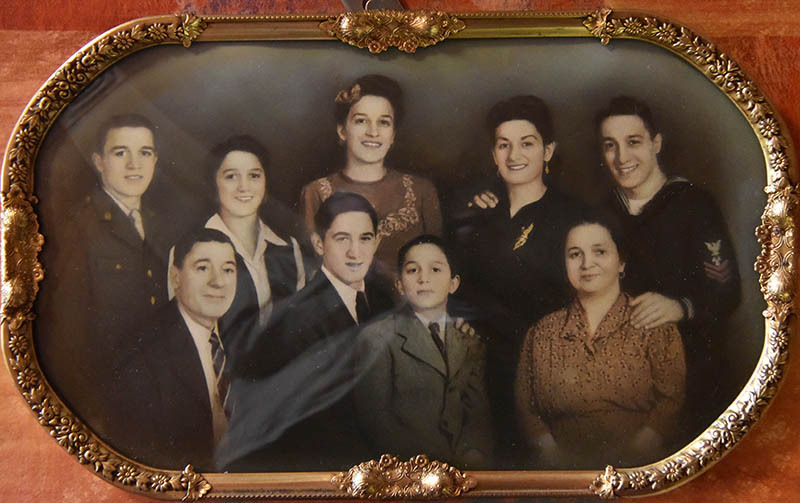 Mary Ann Capo’s family is shown in this family portrait. Both Mary Ann and Frank are deceased.